We all love our snacks in a box or a bag. Quick, easy, convenient -- but the goal is to find the ones that are delicious without making you feel guilty or sluggish after you or the kids treat yourself. And with school in swing, those lunchboxes need to be filled, and when the kids get home from school they are usually hungry and ready for some immediate snack gratification. Here you will find a handful of great snacks to reach for, and you’ll see that many of them have no artificial additives or colors, and many are GMO free and some even gluten free. Because we’re not going to stop snacking – but we are going to try and snack better! You can tell just by looking at these snacks that something good is going on. But don’t let the name or the fact that they are made with a variety of sprouted ingredients fool you (did you know that sprouting makes it easier for your body to absorb all of the good nutrients in various grains and seeds? I did not, but now I do) -- they are delicious. They come in a wide variety of flavors, from Black Bean to Multi Grain to Sweet Chili to Sriracha to Nacho, which will remind you of a chip that rhymes with “Moritos”. Great for snacking, great with dips, like Cheesy Kale and Scallion Dip, Tex Mex Bean Dip and Spicy Guacamole. You may know Clif bars already, but now they’ve come out with a soft-baked bar with decadent smooth and creamy nut butter fillings, geared towards kids. The three flavor combinations include Chocolate filled with Peanut Butter, Double Peanut Butter, and Apple filled with Almond Butter. Non GMO, organic, 140 calories per bar. These sailed through the testers with flying colors. These bars (made by and sold at Target stores), were super solid, really satisfying. All three flavors were met with happy thumbs-ups: Chocolate Chip, Peanut Butter Chocolate Chip, and Apple Berry. They come in a nice compact size, which is great for little ones, or portion control. Made with 12 grams of whole grains per bar. If you are a popcorn lover, then you have to know G.H. Cretors. It’s really popcorn on steroids. Flavors include Organic Chile Jalapeno White Cheddar, organic Dill Pickle (seriously sour), Organic Extra Virgin Olive Oil, and then two indulgent classics, Just the Cheese Corn and Just the Caramel Corn. Finally, for those who can’t decide, Just the Mix, which is a decadent sweet-and-salty combo of the caramel and the cheddar. Gluten-free. I kind of can’t stand when someone says, “This isn’t your mama’s (fill in the blank), but that was in fact my first thought when I tried these cheese puffs. They are cheese puff on steroids… Sriracha Cheddar, Asiago Black Pepper, and Blue Cheese Jalapeno are the available flavors, and they are hardly the kind of snack you mindlessly crunch. The Sriracha and the Blue Cheese Jalapeño pack a serious kick, and the Asiago is milder, but definitely has an assertive cheesy flavor. They are positioning themselves as the first artisanal cheese puffs, and they are worth seeking out. We are popcorn fans (addicts?) in our house. The kind of people who really should only buy popcorn in single serve bags. But that’s not our style. We were very happy to discover this brand with flavors ranging from Cheddar to Sea Salt to Olive Oil, and an interesting hit was the Kale flavor. Available in microwave varieties, too. Non GMO and with a transparent supply chain for those who like to see exactly where each ingredient in their snacks comes from. These guys keep coming out with new combos, and a prettier chip is hard to find (this may not be a big concern in the lunchbox, but I rarely put out plain chips when people come over; Terra Chips are the exception). My recent favorite combo is a bowl filled with a mix of two of their flavors: Pickled Beets and Sweets & Beets. Non-GMO, Gluten-Free. This line of dried fruit is sourced directly from farmers, so there is a sense of freshness (and transparency) — even though the fruit is freeze-dried. The process of drying them preserves the nutrients, but clearly makes it very easy to toss into a bag or a lunchbox or a backpack without worrying about bruising or perishability. The textures are interesting, though they might take a bit of getting used to! 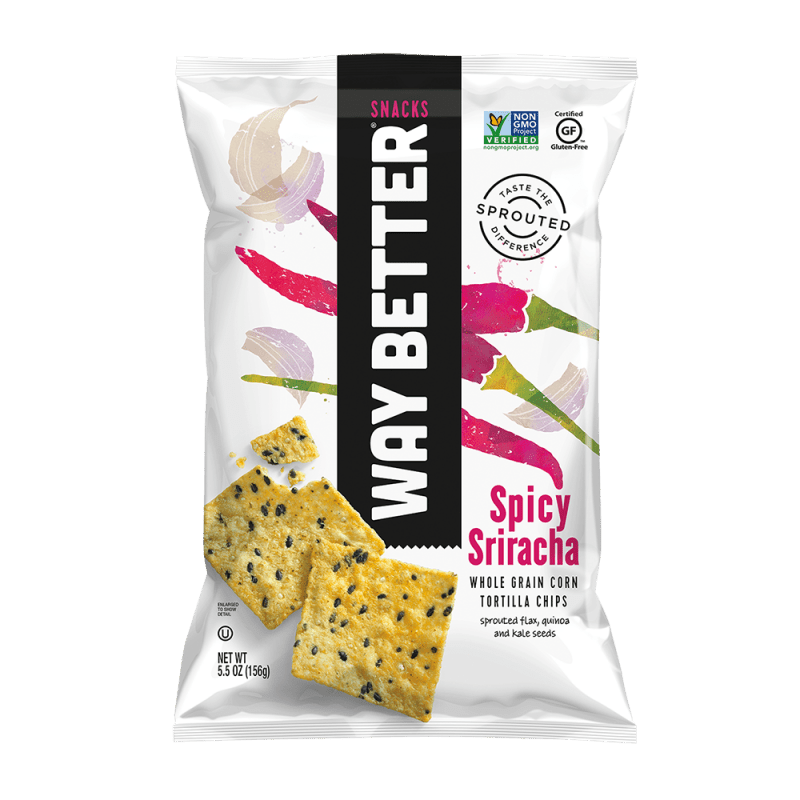 There are mixes, such as strawberries, blueberries and banana; single flavors like mango; and then an interesting offering of freeze-dried beet slices, which could be cool to use as a chip for a dip. Few snacks have as big a following as Teddy Grahams, and now the makers of this popular treat have come out with Teddy SoftBakes. The Softbakes are much larger, one per serving, made of soft cake with a bit of chocolate or vanilla filling inside. Individually wrapped so nice for throwing into a purse or a stroller. No artificial flavors or colors, no high fructose corn syrup. These bars contain just fruits and vegetables; very, very simple. The favorite flavors were Cherry Apple and Mango Apple, made with Chia seeds, which reminded us of old fashioned fritter leathers. 2 servings of fruit per bar, no sugar added, good source of fiber, dairy free, vegan, non-GMO, Gluten-Free. These crackers have a great texture, and while I could absolutely see serving them with cheese, what we really wanted to do was just devour them straight out of the bag. We usually gravitate towards the plainer versions – like the Sea Salt, but if you are looking for something with a punchier flavor there is also Roasted Garlic, White Cheddar, and Roasted Vegetables. Nice source of fiber, Gluten-Free. If cornbread could will itself into becoming a chip, this is what would happen. Baked (in a nut-free-facility), these are very flavorful, with a very satisfying texture. A nice change of pace from other chips. Flavors include original, jalapeno, and the new (and very on trend) honey butter. These satisfying chips are made with a variety of beans, corn and a bit of oil and salt, and that’s it. The beans are popped for a light and crispy and very engaging texture. Really delicious, and also visually appealing. Salt of the Earth was the favorite flavor (we tend to be purists), but they also come in Cha-Cha-Chili. Vegan. Gluten-Free, Non-GMO. These crisp and crunchy popped corn chips come in a variety of flavors from Salt of the Earth to White Cheddar to Sweetly Salted Caramel to Sweet Heat Chili. They are gluten free and have “no artificial anything” in them. Many cultures rely on the humble chickpea for nutrition and protein. In this crispy snack they are perfect for satisfying a craving for crunch, and at the same time getting a hefty dose of fiber and protein. Flavors include Sea Salt, Chipotle, and Falafel. Vegan, Non GMO, organic, Gluten-Free. These Mac n’ Cheese flavored little nuggets will remind you of a certain crunchy cheese snack , but they are made with beans! A decent amount of protein and fiber in every serving is the result, and the cheese flavor is just as powdery finger-licking as you would hope. Serious crunch, too. Gluten-free. If you are looking for a crunchy snack with some heft to it, then Stacey’s Pita Chips are probably going to make you very happy. We love the Simply Naked and the Multigrain (which are also a great vehicle for transporting all kinds of dips from bowl to hungry mouths), but if you want some built in flavor to your chip then you might want to try their many other flavors including Fire Roasted Jalapeño, Parmesan Garlic and Herb, and Toasted Cheddar varieties. Don’t try to eat these in secret - the crunch will blow your cover. Available in traditional and Sweet and Spicy Red pepper flavors, these little portable plastic cups of hummus accompanied by blue and white chips, are a great way to offer up a dip-able protein-filled snack. The chickpeas in the hummus also provide a lot of fiber as well. Both flavors went over well with my tasters. Very simple ingredients, gluten-free. These chips from Good Heath taste and feel very indulgent (and they are in fact, a chip! ), but you have the added bonus of a hefty dose of Vitamins A and C, and the inclusion of 8 vegetables including shiitake mushrooms, carrots, kale, spinach, broccoli, beets and tomatoes. They come in Sea Salt, Jalapeno Ranch, and three other flavors. No nuts, cholesterol, GMOs (in most varieties), and gluten-free.